A 14-year-old boy gone too soon; his tree withstanding the test of time. There’s a particularly picturesque tree in Boyne City that, having withstood decades of harsh wind and weather, many people recognize. A recent storm, however, reminded many what this weeping willow still stands for. 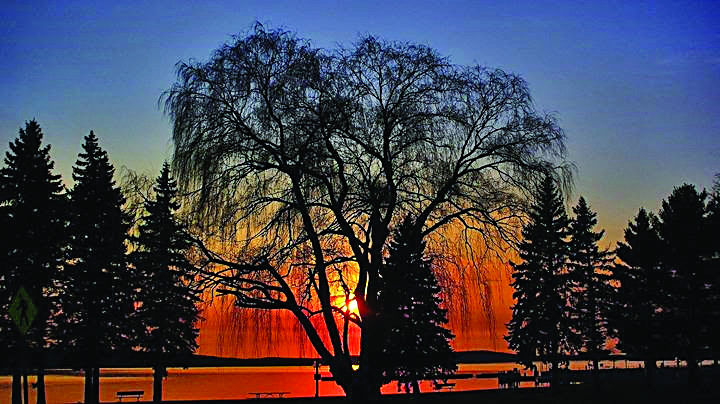 One of the most picturesque trees in Boyne City is a willow in Sunset Park overlooking Lake Charlevoix. It’s grown there for more than 40 years, ever since being planted in memory of 14-year-old Aaron MacNaughton in 1974. The recent windstorms brought down branches but once again the tree managed to weather the storm, good news to those who treasure it, especially MacNaughton family members. “When we heard it might come down, a lot of us were pretty upset,” said Don MacNaughton, the oldest of Aaron’s six siblings. But thanks to the attention of All Aspects Forestry, the tree was not only saved, but trimmed and cleaned up and hopefully ready for another 44 years. “We had really heavy winds, which toppled a lot of trees in Boyne City. The willow took a big hit. There were a lot of branches down, but the structure of the tree stood strong,” said Joe Hauger of All Aspects. Much to the relief of family and fans of the tree, it will continue to provide shade in the summer and a remembrance of Aaron. Aaron MacNaughton was one of seven siblings who grew up in Boyne City after moving north from Carson City. His sister, Julie Cross, said her brother was one of those people who would light up the room with his vivacious spirit. “He was a real card. He never sat still. I thank the universe he had the life he had in 14 years,” she said. The thought of such a high-spirited, fun-loving kid succumbing to a fatal disease wasn’t something that was on anyone’s mind. In those pre-internet and pre-cable news days of the ’70s, the news of the day was much more at arms-length. “You didn’t hear so much about tragedy,” Cross said. His disease came on suddenly. “We were at the kitchen table eating cereal. I vividly remember sitting across from Aaron. He said, ‘Hey, mom, look at this.’ He pulled down his shirt and it looked like a hickey,” recalled Cross. It was nothing so innocent. That was the second week in February. On his 14th birthday, Feb. 21, Aaron was diagnosed with aplastic anemia, in which the bone marrow does not produce blood cells. Cross recalled her mother phoning her with the news while she was with her classmates on a field trip. “I was in high school and on a school trip in Chicago when I got the call. Mom just lost it,” said Cross. The disease progressed rapidly. While in the hospital, Aaron suffered two cerebral hemorrhages and another hemorrhage. It was after the third one that the family decided to let him go. Aaron passed away May 4, less than three months after his diagnosis. “He never made it out of the hospital,” said Cross. When the MacNaughtons lived in Carson City, crops there were routinely sprayed with DDT. One of the known causes of aplastic anemia is exposure to toxic chemicals, and Cross blames Aaron’s death and subsequent health problems of herself and other family members on the pesticide, the use of which was finally banned in 1972 in the U.S.
Cross said the community rallied around the family. She said her brother’s love of life, family and friends seemed to have touched the heart and soul of many people, and the family had received love and support from everyone. She also said the fact his death so quickly followed his diagnosis and the disease was so intense meant that neither family nor friends had time to come to grips with it before he died. “It was very fast, very painful, and ugly,” she said. Aaron’s friends decided that in memory of him they would do something beautiful: plant a tree in the town’s Sunset Park.“It was all put on by Aaron’s classmates,” said Don. It was just over a month after Aaron’s passing that the tree was planted. He and the next-eldest brother, Gregg, are shown in a newspaper photo from June 20, 1974, planting the tree. “It was a special day, a very hard day,” he said. “It was a little tree. The trunk was the size of your thumb, and it was about two and a half feet tall. That’s how little that thing was,” said Cross. Not any more. Over the years, the tree has become a special part of the city, a favorite spot for hanging out, taking wedding or prom photos, or just watching the festivities on the lake. “People sit under it for the Fourth of July. It’s great shade. I’ve sat under it with my kids,” said Hauger. That sentiment is true even for those who don’t know of the tree’s significance. While he was working on the tree, Hauger said a young lady came up to him. “She was maybe in seventh or eighth grade, and said, ‘Please don’t take down my tree. I’m planning to have my senior picture taken there,’” he said.